ZK 7 is an upcoming big release focusing on HTML5 and CSS3. 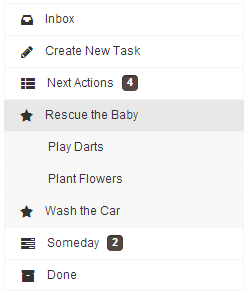 Themes are now based on LESS, which means that code is now much cleaner and more concise. The greatest value of this change to users is that it is now also very easy to create a new theme. This blog will guide you step by step on how to create your own theme for ZK 7. Here we assume you already have a ZK web project created by maven. In this demo we will use the same project in navigation component blog. Refer to this document for using zk-maven-archetype. 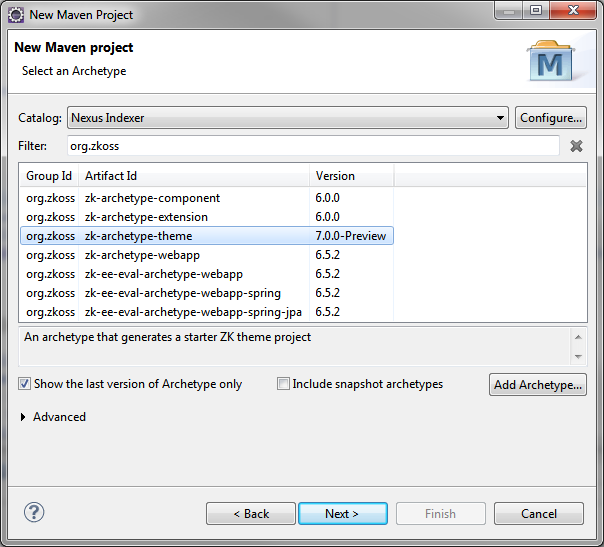 Follow Eclipse wizard to create a new zk theme maven project from zk-maven-archetype. 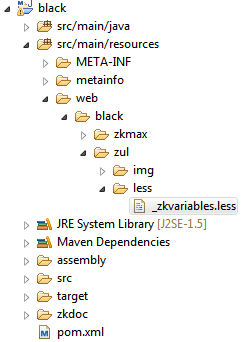 In the previous step, we created a black theme project and we can see how _zkvariables.less file located under web/black/zul folder. This file contains all the LESS variables for ZK’s default theme. 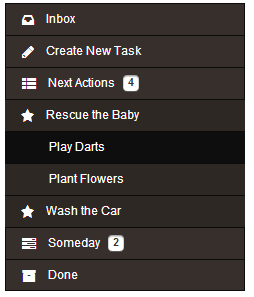 Now, to customize a black theme, simply modify the color code value for these LESS variables. 1. Open pom.xml in black theme project, and uncomment PE/EE related comments if you are building theme for PE/EE edition. 2. 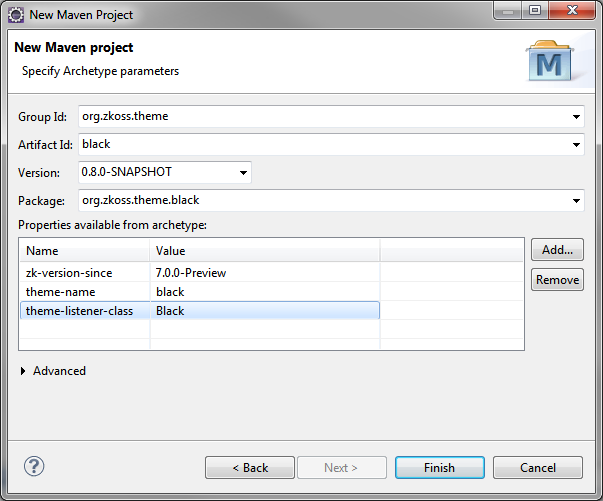 Run maven install for black project, it will compile LESS files and create the theme jar file. 3. In your existing ZK project, add black theme dependency in pom.xml. 4. Start up ZK project to check the customization. 5. If you change LESS variables’ values again, run mvn test again to compile LESS based on latest modification. Then re-start ZK project to check the customization. 6. After you have done the customization, execute mvn install to build the jar file. Previously we have showed you how to use Maven to build theme, here is the step if you would like to build by Ant. 1. Follow the online document to install Apache Ant. 2. Download the following necessary jars from zk repository (right click -> save as) and put in project/lib folder. 3. Write ant script build.xml file like the following sample under project folder, and change input folder and output folder as needed. 4. Execute ant command in command line tool. I tried your sample project and it is not working for me. Nice, I wanted an easy way to do this. It is sad to still see the need for Ant support and examples. I pity anyone attempting to use Ant to build and maintain non-trivial ZK projects, the experienced fragility and needless complexity of Ant projects drove me to migrate all my Ant projects to Maven, ASAP after I was up-to-speed with Maven. Just change the version to 7.0.0-Preview in your pom.xml. It can build by maven with “mvn install”, the Ant parts is an alternative if someone prefer to use Ant instead of maven. I built this with a few customizations, thanks. One question: previously, the themes used a lot of images (e.g. panel-corner.gif, wnd-hm.png, wnd-hr.png, etc.) Looking at the ZK 7 zul.jar, I see that the images are still there, but the css does not refer to them. On our site, we had customized those images. Now, it seems we will need to do the gradient’s etc. via the LESS variables. Is that true? what is the recommend way to customize it? Do I change the window.less file? 1. We use CSS 3 in ZK7 which means a lot of images are not needed anymore. Therefore, you can do the gradients via LESS variables. 2. If you just want to change colors only, you don’t have to change window.less file. We are still working on style guide for ZK7 and will publish the articles along with ZK 7 releases. at line “Themes.register(….)”. What’s the problem of the Themes class? Thanks for every other informative blog. Where else could I get that kind of info wtiertn in such an ideal approach? I have a challenge that I am simply now working on, and I have been on the look out for such information.